Because of its location right on the edge of the Puget Sound, taking a ferry from the shores of Seattle to nearby towns can be a unique way to see more of the state. Just across the Puget Sound from Seattle are cities located on the Kitsap Peninsula, and within the body of the Puget Sound are several islands large and small. Because of this watery location, getting out on the Sound is popular throughout the year, and Seattle's ferries are an easy and affordable way to explore. Washington State is home to the largest ferry fleet in the U.S., and several of these run out of Seattle. Getting out on the water is as simple as walking onto a ferry, and you can turn the journey into a day trip pretty easily. Visit towns on the other side of the Puget Sound or even some of the islands if you branch out of the Washington State Ferry system and look at private ferries or boats as well. Washington State Ferries will generally allow you to drive on, bike on or walk on board. Private ferries and tourism boats don’t. One of the most popular and frequent ferry routes out of Seattle is the Seattle to Bremerton ferry. Taking a jaunt over to Bremerton is a fun day trip, and provides one of the best Seattle skyline views around. Bremerton is a Navy town just across the water from Seattle and has a number of things to do situated right around the ferry dock, so it’s easy to leave the car behind and enjoy Bremerton on foot. You’ll dock right near the Harborside Fountain Park, which is surrounded by plenty of places to grab lunch or dinner. Anthony’s at Sinclair Inlet is among the restaurants and makes a good choice for a sit-down lunch. The USS Turner Joy is permanently docked nearby and is one of the biggest (literally) and best reasons to visit Bremerton. The Turner Joy is a decommissioned Navy Destroyer that the public can step aboard and wander freely (with the cost of admission). Even if you have no connection to military history, the tight confines of the living spaces inside, the open decks and other spaces on the ship are fascinating to explore. If you enjoy military history, the Puget Sound Navy Museum is also near the ship. Venture into the blocks surrounding the water and you’ll find plenty of galleries and shops to explore as well. A ferry to Vashon Island, one of the landmasses visible from Seattle, departs out of Fauntleroy terminal just south of West Seattle. While you can walk on to this ferry, it’s really best to bring the car or your bike along as Vashon is big enough (about the size of Manhattan) and rural enough that getting from one spot to the next is best with wheels. Vashon is only accessible by ferry so it’s a pretty peaceful part of the Puget Sound. Visit the Vashon Farmers Market if you’re there in the early day on a Saturday. Explore Point Robinson Park if you want to hike or beachcomb. Vashon Island is also home to small businesses and can be an artsy place to explore. West Seattle is not exactly another town, but it’s a part of Seattle set apart from the rest geographically and is easily accessible by the West Seattle Water Taxi. The taxi leaves from Pier 50 in downtown Seattle and arrives at Seacrest Dock in West Seattle. Like the Bremerton ferry, the water taxi will get you a great view of the Seattle skyline! Unlike the larger ferries, the water taxi does not allow cars on, but you’ll hardly need a car. Seacrest Dock is located in close proximity to plenty of things to do, especially if you enjoy a good waterfront walk. Right near the dock is Marination Ma Kai, a Hawaiian-Fusion restaurant with outdoor seating in warmer weather. The Alki Trail also follows the water and is a great place for a stroll with stellar views, including views of the Seattle skyline. Head to the left and you’ll run into Salty’s at Alki Beach, an ideal spot for a nice seafood lunch or dinner. Or rent a bike or kayak and explore. The Alki Trail goes for miles so you won’t run out of room. There are parts of the trail where you’ll find sandy beach or shops or galleries. You can catch a ferry to Bainbridge Island from the Seattle Ferry Terminal at Pier 52, and you can either walk on or drive on. The trip takes about 35 minutes and like other ferries, you’ll get an awesome view of the skyline as you leave Seattle. The island overall is about 28 square miles so if you bring your car, you can explore the area. But if you walk on, there’s a town called Winslow within walking distance of the ferry dock. You can rent a bike in Winslow and explore that way as well. Winslow has plenty of shops, galleries, cafes, and restaurants to explore. Find the snack, lunch or dinner of your dreams and take it to go – on a nice day, picnicking in Waterfront Park is a great way to go. Bainbridge Island is also home to Bloedel Reserve and Bainbridge Vineyards – both of which require a car to get to from the dock. Bloedel Reserve is a public garden that includes both formal gardens (including a gorgeous Japanese garden) and wilder forest lands alike, but it’s an ideal place to get in touch with a bit of serenity. Bainbridge Vineyards is a winery that offers public tastings but call ahead to make sure they’re open for a tasting when you plan to visit. The Victoria Clipper is a privately operated passenger-only ferry that departs daily out of Seattle either to the San Juan Islands or Victoria, BC. The San Juan Islands make a better overnight trip, but you can make a day trip on the Victoria Clipper to Friday Harbor. The San Juans are quiet and laid back, filled with open land and seaside bluffs and small, artsy towns. 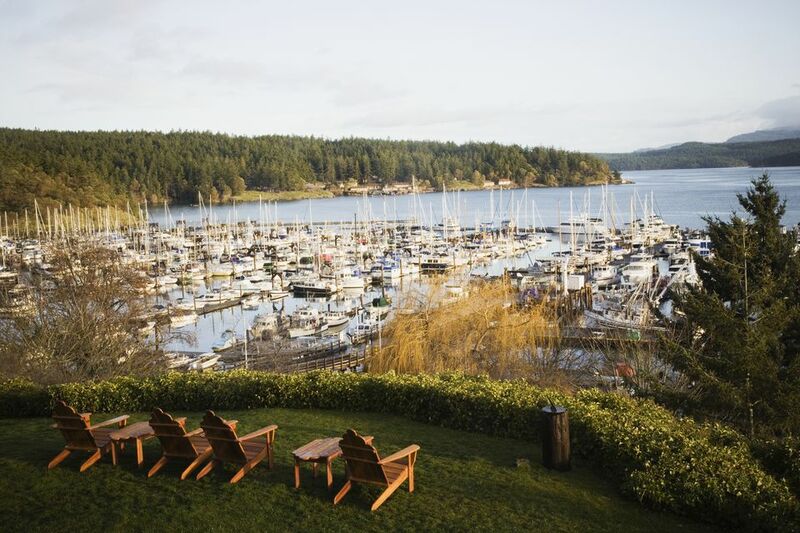 Friday Harbor is the largest town on the islands and located on San Juan Island, but it’s still by no means a large town. Just over a square mile, it’s an easy town to stroll and it has charm around every corner. If you stay the night or longer, this is a great base for whale watching tours or kayak rentals. If you stay the day, just wander. You won’t find any chains. Instead, it’s all local all the time and you’ll find a variety of restaurants, cafes, galleries, antique shops and stores. You’ll find places to rent bikes and mopeds, too. The Victoria Clipper was originally named for its trips to Victoria, BC. The journey is three hours from Seattle, but along the way, you might just spot some sea life and you will enjoy a journey up the Puget Sound. BC is located in Canada so you will need to bring your passport along. Once you dock in downtown Victoria, just about everything is very walkable. If you stay the day, you’ll find plenty nearby, including tea at the Fairmont Empress (book ahead if you intend to do this), the Royal BC Museum, Chinatown, theaters and shops galore. Venture farther afoot and you’ll find the Craigdarroch Castle and Butchart Gardens, which is best visited by tour bus as it’s not within a walkable distance from the harbor area. The Clipper gives you about five hours to explore, but there are also many hotels right near the harbor if you want to stay the night. Taking an Argosy Cruise to Blake Island is not exactly a ferry, but as a boat excursion that leaves from Seattle, the effect is much the same. Argosy runs its Tillicum Excursion many days of the week through most of the year, but not in the winter. The trip includes a 45-minute cruise from the Seattle waterfront to Blake Island, where you'll find the Blake Island State Park and a longhouse where visitors can enjoy a salmon lunch and a show that tells the story of the Native Americans of the Puget Sound area. After the show, there’s some time to explore the shoreline or take a short hike along the forested trails of the park. Just don’t lose track of time as the only way to get to and from Blake Island is either via an Argosy boat or your own boat!